This post is to make you aware of a few learning opportunities for students this fall. On November 1, education students from the University of Wisconsin-Platteville along with their instructors will be hosting an evening of math games and activities. Family math night starts at 5 P.M. and runs until 7 P.M. Bring the whole family! Mr. David, our music teacher, is advising a small group of students to explore our school gardens. This fall they are working on preparing the beds for spring planting. Your child can sign up for this activity through the office. 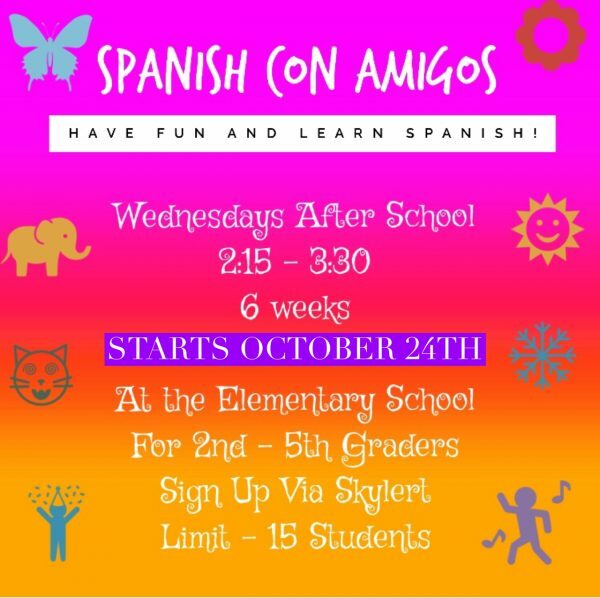 Starting October 24, K-5 elementary students can sign up for Spanish Club. This opportunity will be available to the first fifteen students registered. We are hosting a grade K-1 club and a grade 2-5 club separately. The clubs will be located in the LMC. Stay tuned for a Skylert message in the near future in which you can sign up your child(ren).